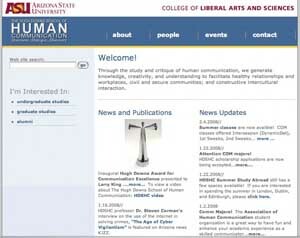 The Hugh Downs School of Human Communication at Arizona State University, Tempe Campus, exists to advance the understanding of message-related human behavior for the purpose of improving communicative interactions. Teaching, research, and service are directed to the continued development of knowledge and the application of communication principles. The School includes over 20 professors and is recognized internationally for scholarly excellence. The School offers a Master’s degree in Communication, and an Interdisciplinary Ph.D. in Communication. The School has four specialty areas besides rhetoric and public communication: intercultural, interpersonal, organizational, and performance studies.